With my first two pregnancies, I gained a lot of weight and I was exhausted. With my son I gained 45 lbs, was swollen, and by the end I just didn’t feel like myself. With my second pregnancy, I again gained more weight than the doctor recommended and it took its toll on my energy level. While making a baby is a lot of work and does have an impact on your body, it didn’t have to come with all that extra weight. When I became pregnant with my 3rd kiddo, I wanted to maintain a healthy weight and also have energy to be on the go. I did have two other kids to chase after. I found the 131 Method and it helped me maintain a healthy weight and keep my energy up throughout my pregnancy. Plus, after I gave birth to my healthy baby girl, I was able to lose the pregnancy weight within 6 months all while breastfeeding my baby. This had such an impact on my health and wellness I knew I had to share it with everyone. Now of course, I’m not advocating dieting while you are pregnant. This is about having a healthy diet not being on a diet. It’s about eating to feel your best, most energized self. Even with that, I had my healthiest pregnancy yet. I gained the least weight, I had the most energy, and best of all, I never felt like I was on a diet. Because I wasn’t. If I wanted to have some cake for my son’s birthday, I could. If I decided to switch up a high carb day with a high fat day I could. If I wanted to eat more meat, I could. What I love about this program is that all sins are forgiven. This is not a diet where they tell you to eat this meal today and that meal tomorrow and if you don't do everything to a T every day, you fail. This is a program where you are given solid information about health and diet, nutrients and lifestyle and you are encouraged to make an educated decision on how you can use this information to live your best life. The best part about the 131 Method is not necessarily the eating plan itself, but the unbiased information that you get. 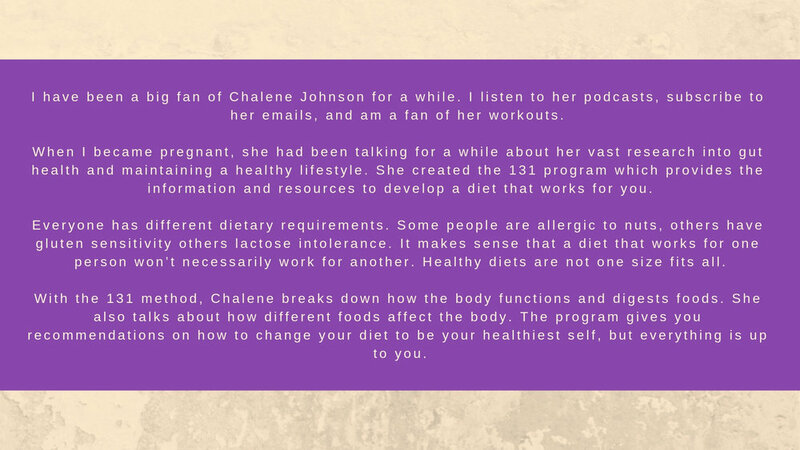 Chalene and her team of nutritionists and integrative health professionals do all the dirty work. They comb through studies, determine who paid for the study and whether the information may possibly be biased. They take what they learn and then pass the information on to us in an understandable way. In this program you really learn how your body works and why different foods affect you in different ways. It's like having a team of researchers at your disposal to get the most up to date and accurate information on foods and vitamins and supplements and healthy lifestyle practices. There is so much more I can say about the 131 Method and it's amazing benefits for creating a healthy lifestyle that works for you, but it wouldn't all fit here. My love for the program is why I became an ambassador for the program so I can share my experience with all of you. If you have any questions about my experience, what it entails, or anything else feel free to reach out on social media or email me at emily@themultitaskingmomsite.net. If you are interested in trying it yourself, I am so happy for you. You can check out all the details by clicking the button below.